Bali Bliss. Finally, this weekend, Sanoop and I are going to Bali together! We were supposed to go for my 30th birthday back in September, but didn’t because of the volcano eruption warnings. I went 4 times in my first 6 months of living in Singapore; all by myself the first time around, and most recently for Christmas and New Year last year, when my friend and I were yogis in Ubud and surfers in Canggu. Sanoop has mainly been there for company off-sites and media conferences. Once, he even went as a freelance travel writer, crafting this hilarious article. 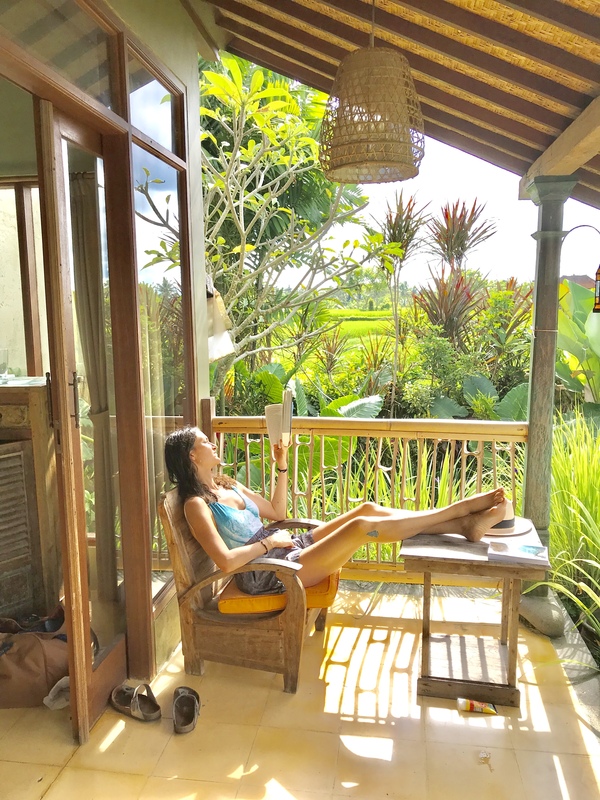 This time around, the two of us along with his parents and a couple of their friends from Kerala have rented a three-bedroom villa set in the rice paddy fields a few minutes’ walk from the centre of Ubud. We’ve booked a sweet, reliable driver, whose sense of direction as well as English are impeccable. We’re excited to experience Balinese new year celebrations – starting with the Friday night procession of giant, elaborate papier-mâché effigies, ogoh-ogoh, followed by Nyepi, the Day of Silence. On Sunday, we’ll do some exploring – navigating the interests and energy-levels of six different people as well as we can, haha. Importantly, it will be nice to spend time together in one of the most blissful places imaginable. Ogoh-Ogoh. After settling into our lovely villa when arriving on Friday night, quickly having emptying a supermarket on the way from the airport to make sure we won’t starve on Saturday (the Balinese people refrain from eating on Silent Day; while in theory I do like the idea and could consider doing it next year, it’s not gonna happen this time around), and after eating a hearty local dinner at a small local warung, we find a good spot along the intersection by Ubud Palace, from where to watch the procession of malicious-looking 25 feet tall paper characters painted in striking colours and impressively carried around by masses of people on pads made of timber planks and bamboo. There’s music, dance, smoke effects and light shows in the streets. To think that these creatures are build and destroyed every single year – one can’t help but wonder about the relationship between the main purpose of these demons, which is to purify the natural environment of any spiritual pollutants emitted form the activities of living beings, and then the massive environmental pollution that the burning of these acrylic-, glue- and styrofoam-based effigies the days after the procession will cost… Oh well. On Sunday, we learn that the Green School is doing what they can to inspire the locals to start constructing the effigies from eco-friendly, recyclable materials. Either way, it’s a great show. With so many Balinese people and even more tourists from all corners of the world present. Remarkably peaceful and intense at the same time. At 10:30pm, after we get back to our villa, and I sit outside by the pool in the dark under the twinkling stars, listening to crickets and distant sounds of the on-going celebrations, fireflies hovering around over the pool, I have my last call of the week and feel butterflies buzzing around in my stomach at the thought of WEEKEND. Silent Day. No travel, no work, no fire, no entertainment. Those are the rules of the traditional Balinese Day of Silence. No one leaves their house. Mobile data has been turned off all over the island. Every establishment, including the airport, is closed. It’s been such an intense week, what with a busy work schedule and hosting S’s parents. Without being a hindu or quite intending to respect the above-mentioned rules, I am very pleased with the concept. When was the last time I didn’t leave a house all day? Must be years ago… A day of calm reflection. No planning. No responsibilities. We still do things, but with a deep sense of awareness and only driven by inclination. We cook three delicious meals, swim laps in the pool, talk and laugh, read books, magazines and newspapers, take and edit photos, play Scrabble, take several naps, yoga, drink a glass of wine, stare calmly into space while taking deep, soothing breaths, soak in the bountiful pleasures of our pretty little garden – orange and frangipani trees, multiple types of palms, geckos in different sizes. When, surprisingly quickly, it grows dark, we feel really sleepy – and everyone retires to bed briefly after admiring the night sky, which is so spectacularly clear in the absence of street light and traffic. Morning Run. As much as I enjoyed Silent Day, I also love the feeling of being able to RUN FREE as soon as I wake up on Sunday, haha. Down the narrow path between the paddy fields. Down through the cosy town streets bustling with temple activity, scooters, curious sights – a guy is transporting a crowing rooster in a cage on the side of his scooter; beautifully dressed women arrange flowers, incense sticks and treats on offering plates in front of the temples; millions of shades of lush greenery shine in the sun along the streets; a few couples are doing yoga out in the middle of the fields. Ahh… to feel my legs and lungs working, to take in all the sights, smells, sounds, to have the freedom of movement! Dramatically jeopardised when I trip across a storm drain, losing my left leg in the space between a few loose grill bars… Panicking slightly at the thought of what I went through with my right knee last year, I pull out the poor thing and scrutinise the bloody scrapes and bruises that line my knee and entire shin. It looks ugly, but it doesn’t seem as if I tore or broke anything. I test its flexibility and ability to carry weight, and after walking for a little bit, I start running again without problem. Phew. Alchemy. Sanoop and morning light are on my very shortest favourite-things shortlist, and when I get to hang out with both of them, my heart starts singing, haha. For Christmas, I gave him a gift certificate towards a breakfast date once a month. Well, we eat breakfast together on most days, but, you know, a special breakfast, served in places neither of us have been to before. Preferably in a different town each time. January: Sydney. February: Venice. Today: Ubud. We head to Alchemy, where you get to create your own smoothie bowl from a counter bar that looks like a Pick ‘n’ Mix for hipster health freaks. We love it. Just as we love the fact that our window table in the light, airy, lush venue is drenched in morning sunlight. Green School. First stop on our group day trip. Even on a Sunday, a guided tour of the international Green School, a half-hour drive south-west of Ubud, makes everyone want to be, or at least feel like, a kid again, or at least a student – of life, nature, sustainability, balance, creativity, community. For a little over an hour, we’re guided from one incredible bamboo structure to the next at the inspirational, original, unconventional, entrepreneurial, mind-expanding, tech-savvy school and marvelling at all of the idyllic information we receive along the way. Watch founder John Hardy’s TED talk on his green school dream. Garden Kafe, Yoga Barn. No yoga class today; my left leg is pretty sore and swollen, actually. But we do head to Ubud’s ultimate Mecca for happy yummy hippie yoga bunnies – just to enjoy its atmosphere and a healthy meal at its garden cafe. Warung Pulau Kelapa Indonesian Cuisine. Such a wonderful local dining experience! Beautiful wooden interiors with great paintings on the walls. Excellent service. We’re accompanied by a friend of Sanoop’s from Hong Kong, who is staying in Ubud for a few weeks. He’s such a sweet addition to our party – a good conversationalist, cheerful, kind. An altogether pleasant experience, complete with an after-dinner walk in the terraced garden out back, from which the cooks pick vegetables and herbs to use in their flavourful, wholesome dishes. Yum! 4 Foodie Tips. When in Ubud, make room for the locally sourced food at simply beautiful Locavore, the local spices and ingredients incorporated into Western dishes at Mozaic, the natural ambiance and garden bounty at Warung Pulau Kelapa … and for dessert at Room 4 Dessert! Eat Love Pray. It just dawned on Sanoop and me that we’ve been eating and loving in Italy, India and Bali within the past three months, haha… perhaps we should start praying? We attended Christmas morning mass in a Goan church, stayed with nuns at a convent in Lucca and experienced the contemplative, meditative Silent Day … Could be that the spiritual element is well covered? Now, unlike Elizabeth Gilbert, we weren’t depleted, stressed-out, in desperate need of a refresh before embarking on our travels… yet, I am sure, if we reflect on it a little bit, this combination of experiences have benefitted us/him/me in multiple ways.